I am not a cheat and never have been. It was an instinctive reaction to a ball that was coming extremely fast in a crowded penalty area.... Naturally, I feel embarrassed at the way that we won and feel extremely sorry for the Irish who definitely deserve to be in South Africa. UPDATE, 11/20 9:13 AM: FIFA has officially rejected an Irish appeal for a rematch. UPDATE, 11/19 9:38 AM: The Guardian reports that FIFA officials have eliminated the possibility of France and Ireland playing a rematch. EARLIER: French soccer player Thierry Henry has admitted to committing a handball just before teammate William Gallas scored a crucial goal in France's World Cup qualifier match against Ireland. 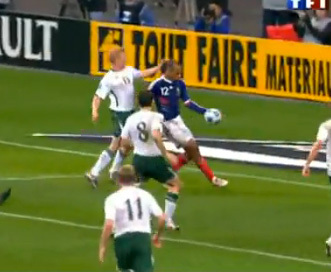 (AP) SAINT-DENIS, France -- France qualified for its fourth consecutive World Cup when officials missed an obvious hand ball by Thierry Henry that led to William Gallas' overtime goal in a 1-1 tie against Ireland on Wednesday night. With help from Swedish referee Martin Hansson, who failed to call the hand ball, France avoided a penalty-kicks shootout and won the home-and-home, total-goals playoff 2-1. The French had come away with a 1-0 victory in Dublin last Saturday. The game appeared headed to penalty kicks when Florent Malouda sent a free kick to Henry at the post to the right of goalkeeper Shay Given in the 103rd minute. 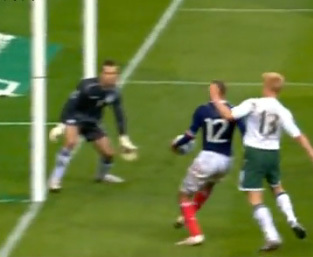 Henry got between defender Paul McShane and Given, stopped the ball with his left hand, then used his hand again and poked the ball with his outstretched right foot in front of the net. "He almost caught it and walked into the net with it," said Robbie Keane, who had put the Irish ahead in the 33rd minute. Gallas headed the ball into the net from about 1 yard as Irish players raised their hands in protest at Hansson. Soccer does not allow officials to use video replay, although the assistant referees can point out infractions to the referee.